Pronated feet? We can help you. What if the doctor tells you you have pronated feet? Pronated feet as a diagnoses sounds worse than it is. If your doctor recommends you to speak to your podiatrist at The Perth Foot Clinic, because you may have pronated feet, then by all means come and see us at the practice. When your podiatrist talks about the pronation of your foot, we mean the natural movement of your foot, and more specifically how your foot rolls inward with each step, as your foot lands on the floor. In podiatry terms, we talk about a pronated foot when the range of this rolling movement is out of the normal range. That’s when an overpronated or an underpronated foot can change the balance of your body weight on your ankles and your knees, and this can cause pain, discomfort and excessive pressure on many other joints, causing pain and problems all the way up to your back. When are my pronated feet a problem that needs attention? If your feet’s inward movement is slightly smaller or larger than the average, it could be that this does not cause you any problems at all. What we look at during a biomechanical assessment at our podiatry clinic in Cottesloe, is the degree, the speed and the timing of your pronation. Our first mission as your trusted podiatrist is to identify whether there is an issue that could cause other problems in your feet, legs or back because of your foot positioning. You may hear different terms being used when doctors and podiatrists discuss pronated feet. 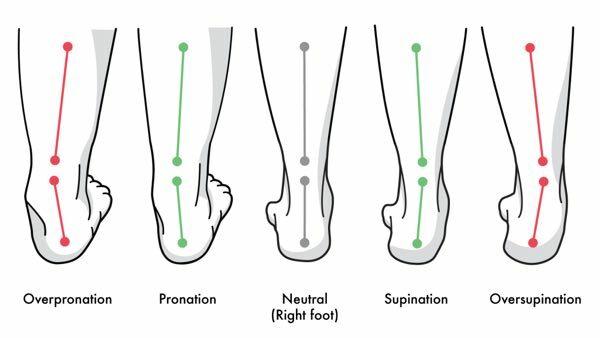 Sometimes the terms overpronation and underpronation are used, others talk about overpronation and supination to indicate an excessive inward movement or a lack thereof. When a customer needs help with pronated feet, we often make use of Naboso-Proprioceptive Insoles. They stimulate the small nerve fibres within your feet and they are your balance mechanism. The insoles help build a stronger proprioceptive balance mechanism, in other words a balance system that depends on nerve stimuli in your foot. When customers start using those insoles, they often tell us that the adjustment of their foot positioning and their general posture also helps eliminate or reduce other problems in their legs, knees or hips. That’s because the Anatomy Trains in our body connect every part, every joint and every muscle from the feet up. This is exactly why we believe in building better bodies from the feet up, here at the Perth Foot Clinic, as a team of passionate podiatrists. At Perth’s Foot Clinic we are a team of highly experienced podiatrists. We help our customers with family podiatry services as well as more advanced, customised exercise programs for semi-professional and professional sports people. Building on our vast experience, we keep nurturing a growth mindset, integrating the latest technologies in podiatry and building on our expertise day after day. If you experience any type of discomfort in your lower legs, come and see us at The Foot Clinic, for a bio-mechanical assessment which will help you understand how all the joints and bones in your feet and legs work together. Your feet carry you a long way throughout your daily life, so it’s worth taking good care of them. Read more about our Naboso-Proprioceptive Insoles and how they can help treat your pronated feet.